I love to decorate my house for the holidays! We moved last summer, so I’m still trying to figure out decorations. The new house is a totally different layout, plus I have more space, so it has been a slow (but fun!) process. 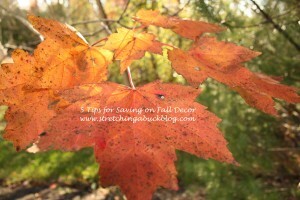 Here are a few tips that I have for savings money on Fall Decor and Halloween Items. I would love to hear your thoughts and tips in the comments section! 1) Shop Goodwill, Consignment and/or Garage Sales: One of my friends and I met up at Goodwill during the last week of August to see what we could dig up. 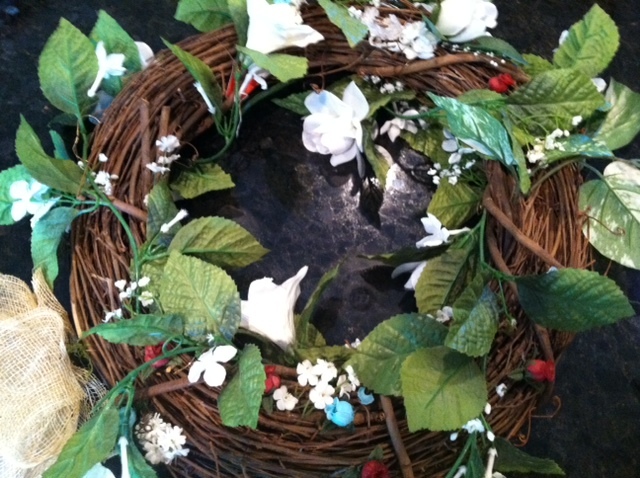 I found this not-so-pretty wreath for just $2. The grapevine wreath underneath was in great shape, so I decided I would tear the flowers off and make my own fall wreath. 2) Make it yourself! I am not crafty. Let me repeat that – I am not crafty. But there is something about Pinterest that makes me think I can do all kinds of things myself, do any of you feel that way too? I found this wreath on Pinterest and decided that I wanted to make something similar. 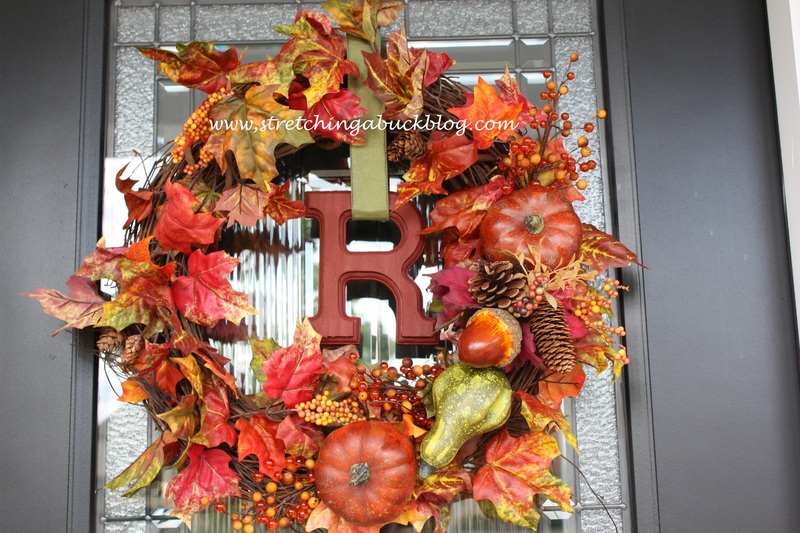 After a trip to Hobby Lobby (shopping sales and with a coupon) here is what I ended up with – my very own DIY Fall Wreath for a grand total of $28! 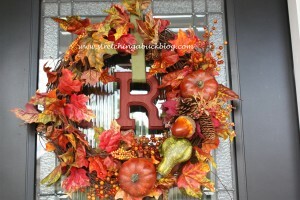 (Most of the wreaths I have seen at local nurseries etc… have been $50+). I was even able to reuse the wire from the Goodwill wreath to attach the new foliage. I also plan to reuse the “R” and the green ribbon at Christmas time. 3) Re-purpose Items you Already Own: I have a small antique table that sits in my foyer. On it I have 2 glass hurricane vases that I scored for FREE at Kroger a few years ago when they were having a Kroger Marketplace Holiday Promo. 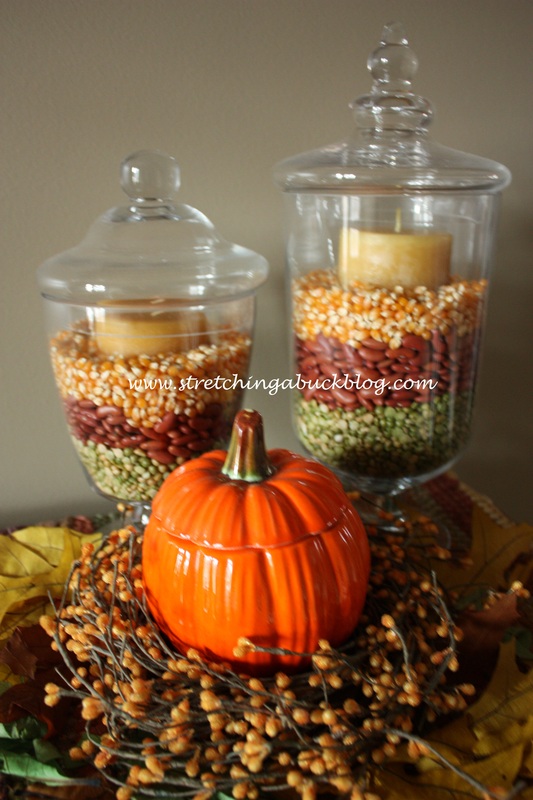 I typically have the vases filled with generic “fill” that I purchased at Target, but decided that I wanted to change them out for fall. It was Pinterest to the rescue again when I saw these. 4) Shop Local! I love decorating the outside of my house with pumpkins, gourds, dried corn stalks, mums and straw bales, but the cost can add up fast! My subdivision is out in the middle of what used to be a lot of farmland, and a few small family farms still exist. A few years ago I noticed a pumpkin sign at the end of a road I drive past daily, so I decided to investigate. I am so glad that I did! I can purchase a wide variety of pumpkins for $5 and under, gourds 3 for $1, cornstalks for $2-3 plus more. If I were to purchase these items at local nurseries or “tourist” farms, I would easily pay double – sometimes triple these prices. Be sure to ask around at your local farmers market to see if any local to you farmers offer fall items! Or take a drive some weekend afternoon – you never know what you might stumble upon. 5) Shop Early OR Late: To save on mums, if you hit your local nursery early (before the mums are in bloom) – you can sometimes score them for super cheap. I found small mum bushes for $2.99 toward the end of August. Mums are one of those items that you can really save on if you take the time to shop around! 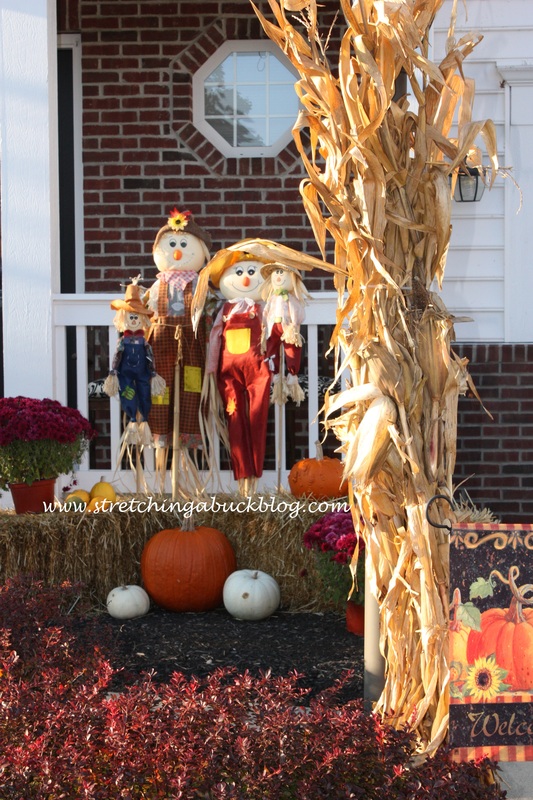 Likewise – if you wait until just after Halloween and Thanksgiving you can score great deals on items that you can use next year – decor, costumes and more. What are your best tips for saving on fall decor? Last night, without my Husband, I made a trip to the Dollar store, where I stocked up on lots of goodies for my holiday decoration. They have wreaths, and ornaments, my creativity was in overload. You are so right about the Goodwill, I picked up a brand new (with tags) bare wreath for $2 in July, last night I picked some ornaments to decorate it! My son works at Goodwill and they get things from Target and other stores and sell it. Things they have marked down to 75% off. There are a certain # of days they keep it and if it doesn’t sell they send it there. Most if not all has the tags or stickers still on. You never no what you will find.